How many bottles do you have at home? I tried using cellartracker for a while but ultimately didn’t get on with it and went back to my spreadsheet. For some of the stuff I wanted to record I just couldn’t figure out how to do it. I record all the usual stuff: name, region, appellation, vintage, drinking window, vendor notes, my tasting notes, bin, etc. Which can all pretty much be done on CT but I also record vintage rating, alternate drinking window (from various sources), where bought, order number (where appropriate), price paid, my rating, pro rating, and one or two other bits. I also move entries to different places in the spreadsheet: on order, EP, ready to drink, laid down, drunk. All of which makes it easier for me to use. I guess I just didn’t find CT flexible enough for my needs. You can do almost all of that (maybe all, not sure) in CT but I agree it takes a bit of effort to learn your way around and what’s the point if you have something that works for you? I opened my account years ago but only started using it last year because TWS reserves page didn’t do much and I wanted to keep track of that and the wines at home better. But I don’t have much need for anything beyond the basics right now. Whilst I know I can do pretty much everything on ct, what I can’t seem to do is get all that info at a glance and organised visually the way I want it. As you say, in the end I decided to stick with what works for me. 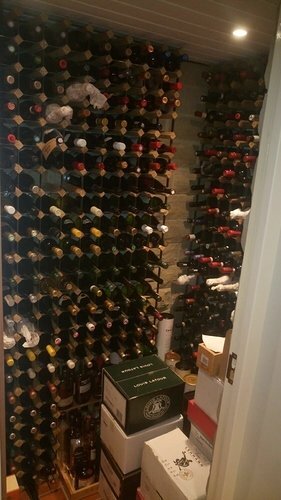 I usually have between 1250 to 1400 at home in my cellar which i think is about right. Good selection of Countries/producers. With that level of alcohol you’re most welcome to help. this is exactly the same as me…its a bit like my view on my vegetable garden…I love seeing the young shoots turn into a harvest ! If it helps, they do have a bulk import tool. You can even import tasting notes. Also the lookup tool is remarkably accurate - often based on quite scant input information. I found that putting about 400 bottles on from a spreadsheet wasn’t as painful as it sounds…just need to keep the discipline of updating.